How to install xshippingpro in OC 2.x? Although I am giving screenshot of xshippingpro but these steps applicable for any module. So any module can be installed by following these steps. First, unzip downloaded zip file. Now, please Go to Admin -> Extensions -> Extension Installer. Then select “xshippingpro.ocmod.zip” and click on continue. Now please navigate to admin -> Extensions -> Shipping. 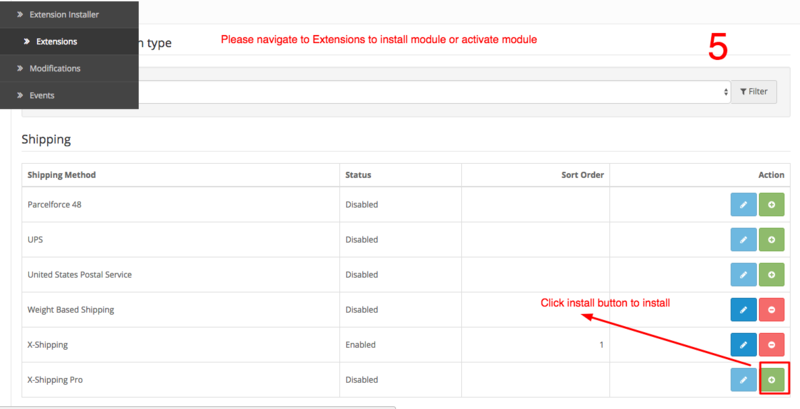 Now click on Install button located beside X-shipping pro row. This entry was posted in Modules, Trick & Tips, Xshippingpro and tagged install, oc2, xshippingpro on March 10, 2017 by samir.